Do you want to recognize the most suitable models for analysis of statistical data sets? This book provides a hands-on practical guide to using the most suitable models for analysis of statistical data sets using EViews - an interactive Windows-based computer software program for sophisticated data analysis, regression, and forecasting - to define and test statistical hypotheses. Rich in examples and with an emphasis on how to develop acceptable statistical models, Time Series Data Analysis Using EViews is a perfect complement to theoretical books presenting statistical or econometric models for time series data. The procedures introduced are easily extendible to cross-section data sets. An essential tool for advanced undergraduate and graduate students taking finance or econometrics courses. Statistics, life sciences, and social science students, as well as applied researchers, will also find this book an invaluable resource. I Gusti Ngurah Agung is a Lecturer and Academic Advisor at the Graduate School of Management, Faculty of Economics at the University of Indonesia. He has been teaching mathematical statistics and applied statistics since 1960 at the Makassar Public University as well as Hassanudin University, Makassar, and since 2006 at the Graduate School of Planning, Strategy and Public Policy, University of Indonesia. Agung has authored more than 10 pocket books in applied statistics (in Indonesian). He holds a BSc in Mathematical Education from Hassanudin University, a Masters in Mathematics from the New Mexico State University and a second Masters in mathematical statistics as well as a PhD in biostatistics from the University of North Carolina at Chapel Hill. 1 EViews workfile and descriptive data analysis. 1.1 What is the EViews workfile? 1.2 Basic options in EViews. 1.5 Special notes and comments. 1.6 Statistics as a sample space. 2.5 Bounded autoregressive growth models. 2.6 Lagged variables or autoregressive growth models. 2.8 Growth models with exogenous variables. 2.9 A Taylor series approximation model. 2.10 Alternative univariate growth models. 2.12 Multivariate AR(p) GLM with trend. 2.13 Generalized multivariate models with trend. 2.14 Special notes and comments. 2.15 Alternative multivariate models with trend. 2.16 Generalized multivariate models with time-related effects. 3.3 Piecewise S-shape growth models. 3.4 Two-piece polynomial bounded growth models. 3.5 Discontinuous translog linear AR(1) growth models. 3.6 Alternative discontinuous growth models. 3.8 Generalized discontinuous models with trend. 3.9 General two-piece models with time-related effects. 3.10 Multivariate models by states and time periods. 4.2 Statistical analysis based on a single time series. 4.3 Bivariate seemingly causal models. 4.4 Trivariate seemingly causal models. 4.5 System equations based on trivariate time series. 4.6 General system of equations. 4.7 Seemingly causal models with dummy variables. 4.8 General discontinuous seemingly causal models. 4.9 Additional selected seemingly causal models. 4.10 Final notes in developing models. 5 Special cases of regression models. 5.2 Specific cases of growth curve models. 5.5 Cases based on the US domestic price of copper. 5.7 Cases based on the BASICS workfile. 6 VAR and system estimation methods. 6.3 The vector error correction models. 6.4 Special notes and comments. 7.2 Should we apply instrumental models? 7.3 Residual analysis in developing instrumental models. 7.4 System equation with instrumental variables. 7.5 Selected cases based on the US_DPOC data. 7.6 Instrumental models with time-related effects. 7.7 Instrumental seemingly causal models. 7.8 Multivariate instrumental models based on the US_DPOC. 7.9 Further extension of the instrumental models. 8.2 Options of ARCH models. 8.4 ARCH models with exogenous variables. 8.5 Alternative GARCH variance series. 9.2 The unit root tests. 9.3 The omitted variables tests. 9.4 Redundant variables test (RV-test). 9.6 The Ramsey RESET test. 9.7 Illustrative examples based on the Demo.wf1. 10 Nonlinear least squares models. 10.5 Special notes and comments. 11.1 What is the nonparametric data analysis. 11.2 Basic moving average estimates. 11.3 Measuring the best fit model. 11.4 Advanced moving average models. 11.5 Nonparametric regression based on a time series. 11.6 The local polynomial Kernel fit regression. Appendix A: Models for a single time series. A.4 First-order moving average model. A.5 Second-order moving average model. A.6 The simplest ARMA model. Appendix B: Simple linear models. B.1 The simplest linear model. B.2 Linear model with basic assumptions. B.3 Maximum likelihood estimation method. B.4 First-order autoregressive linear model. B.9 Special notes and comments. Appendix C: General linear models. C.1 General linear model with i.i.d. Gaussian disturbances. C.2 AR(1) general linear model. C.3 AR(p) general linear model. C.4 General lagged-variable autoregressive model. C.5 General models with Gaussian errors. Appendix D: Multivariate general linear models. D.1 Multivariate general linear models. D.2 Moments of an endogenous multivariate. D.4 Vector moving average model. D.5 Vector autoregressive moving average model. D.6 Simple multivariate models with exogenous variables. D.8 Maximum likelihood estimation for an MGLM. D.9 MGLM with autoregressive errors. 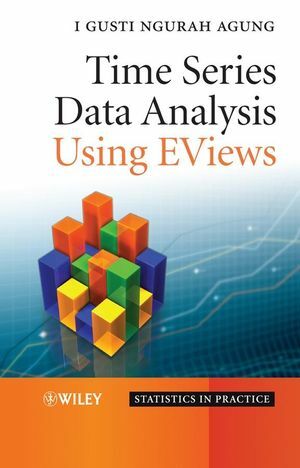 Time Series Data Analysis using EViews Visit the companion website to access the data sets discussed inthe book.